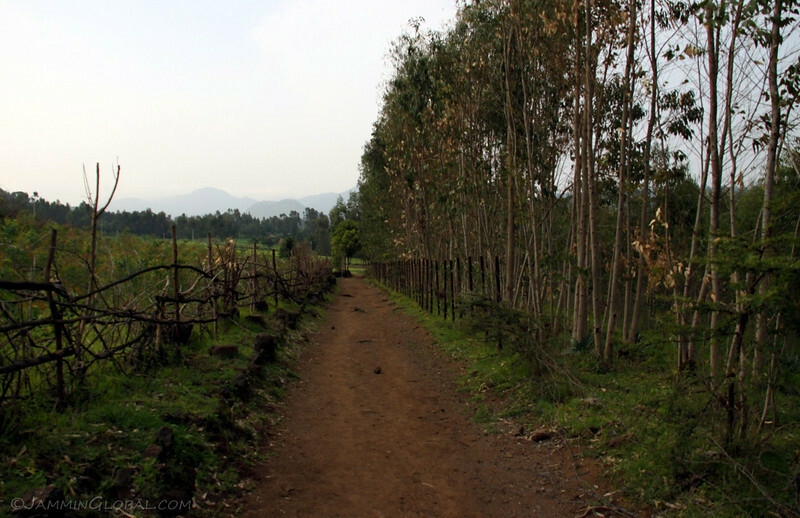 I had a wonderful two weeks break in Gorgora and now I was back on the road for a two week loop through northern Ethiopia. 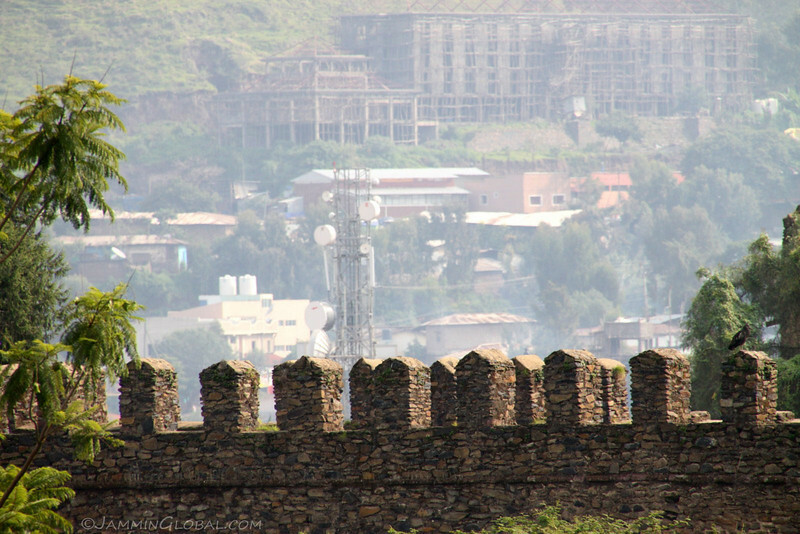 The biggest city in this area is Gondar, known for its castles. 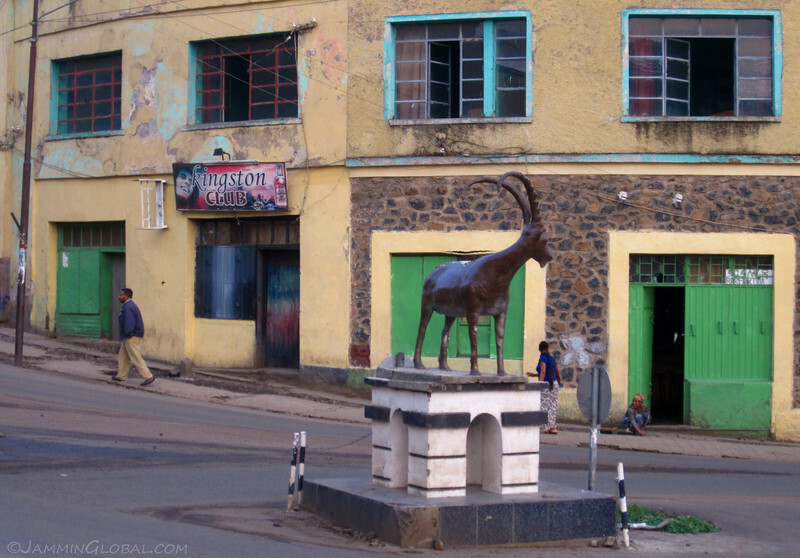 The city is also the gateway into the remote northern parts of the country with the majestic Simien Mountains nearby. 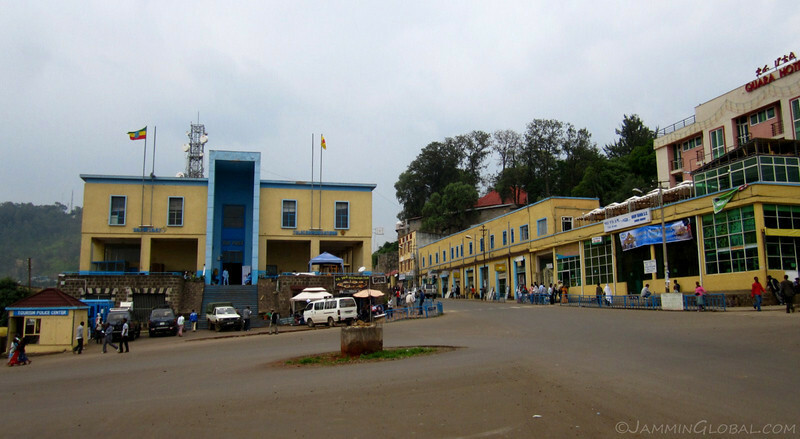 The central piazza of Gondar. The city was established in the 17th century but the influence of the short Italian occupation around the late 1930s is still evident today in the buildings around the city center. They have a simplified Italian Moderne style. 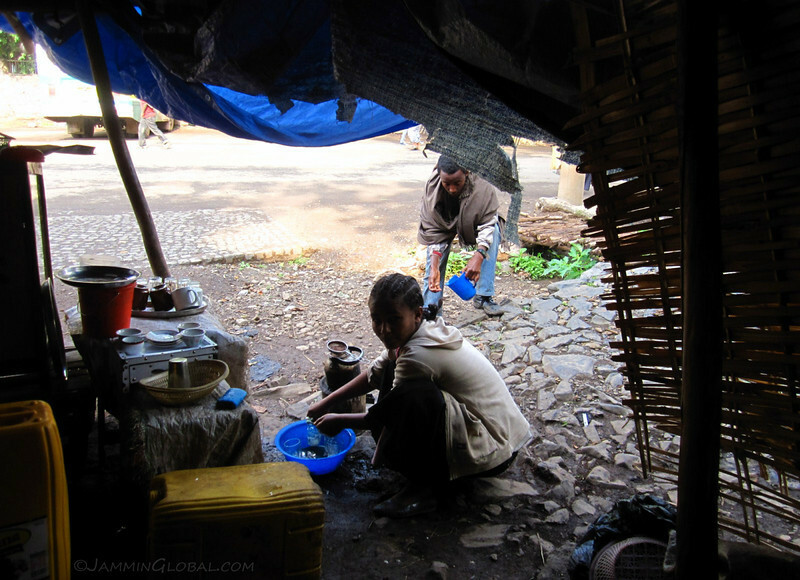 On the streets of Gondar. 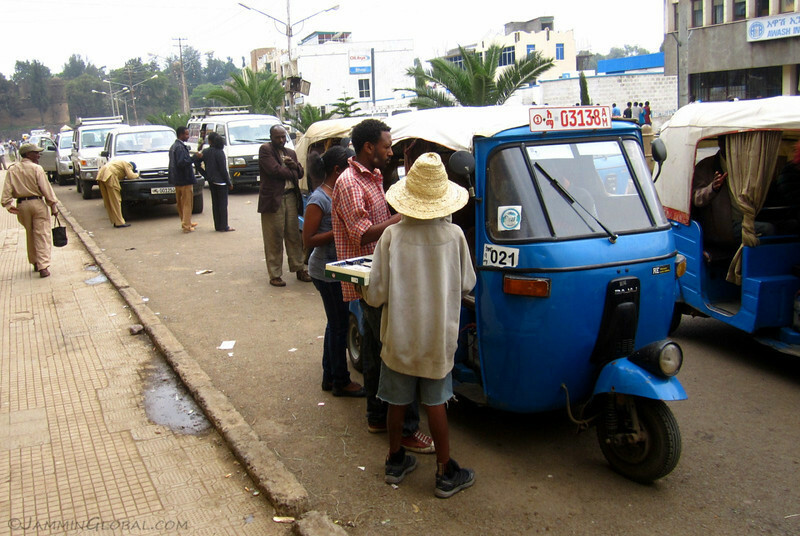 Being an Indian, I’m always proud to see Bajaj’s Auto Rickshaws (tuktuks) in foreign countries. They’re noisy but fill the gap between two-wheel and four-wheel transport. I had been sleeping in my tent for the two weeks at Gorgora before this, so I was more than happy to pitch up again. I happened to be in town during the graduation weekend of Gondar University and thus, most of the hotel rooms were booked. 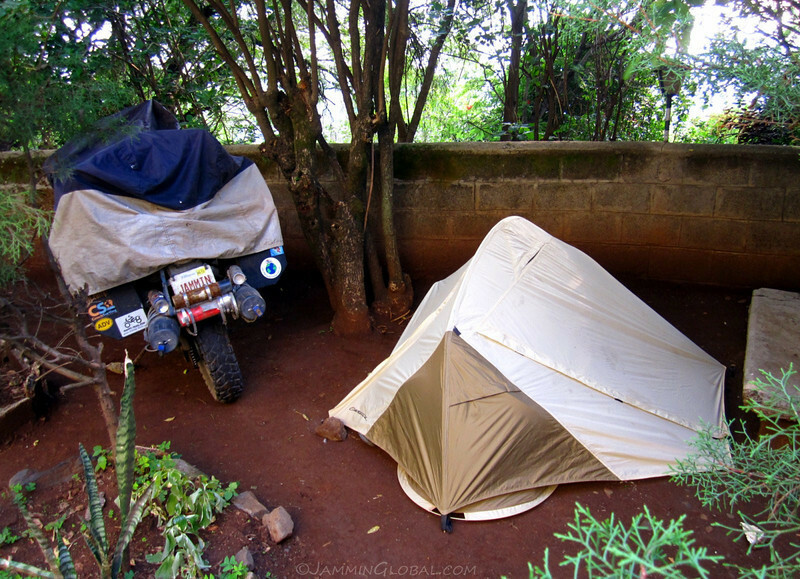 Tarara Hotel, up above town, is known as being friendly to overlanders and they let me camp in their garden. 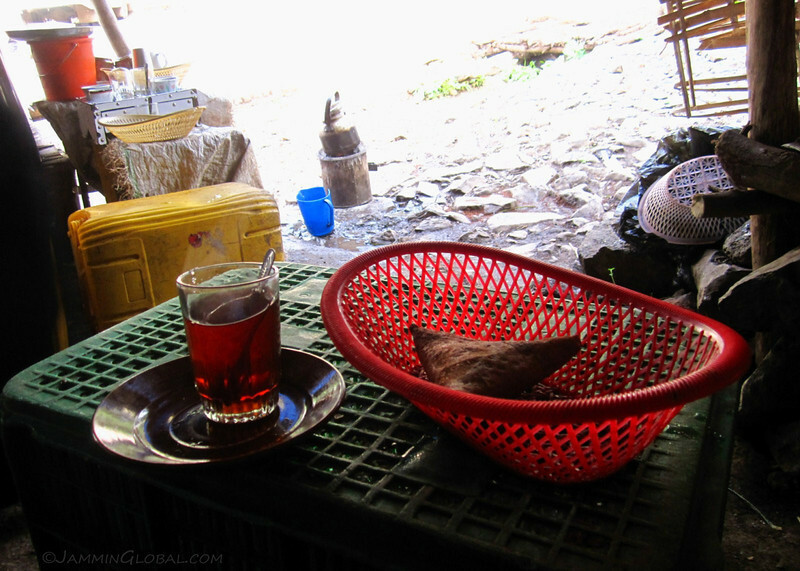 I walked down from my encampment and found a small tea stall. Hot tea and a samosa before taking a walk around town. 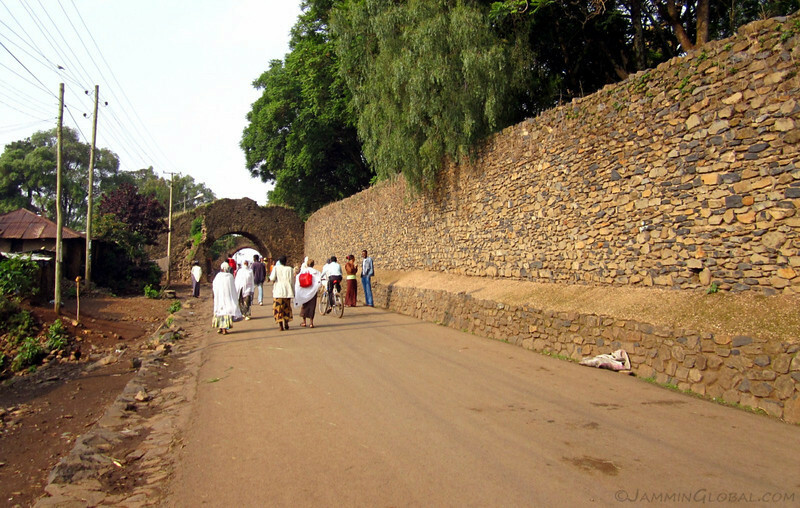 Walking along the wall of Gondar’s castle towards one of the entrance gates. 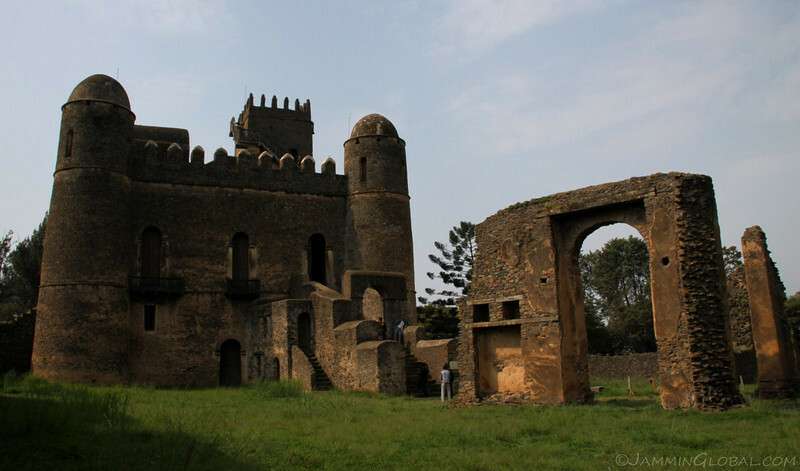 The grand Fasilides Castle in the Royal Enclosure at Gondar. 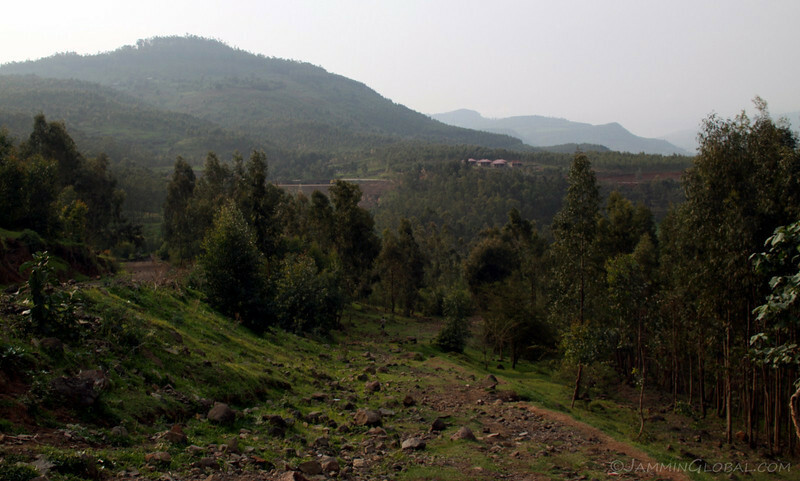 Up till the 17th century, the rulers of Ethiopia generally did not have a permanent capital but moved around their kingdom with their entourage in fortified encampments. 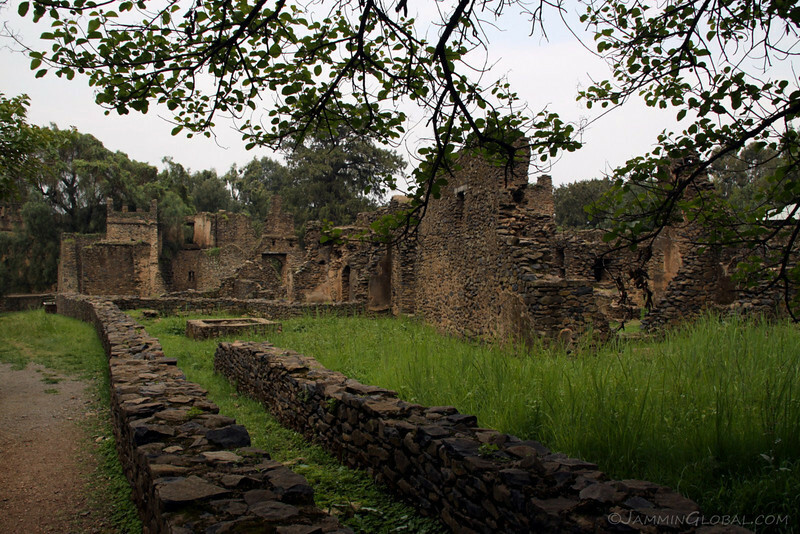 Emperor Fasilides broke with tradition and decided to make Gondar his capital around 1635. The castle is set in beautiful grounds and the cool weather at 2,150 m (7,000 ft) makes for a pleasant visit. The castle is surrounded by the modern city but it’s future has been protected as it was recognized as a UNESCO World Heritage site in 1979. Grand arches leading to grand empty halls. 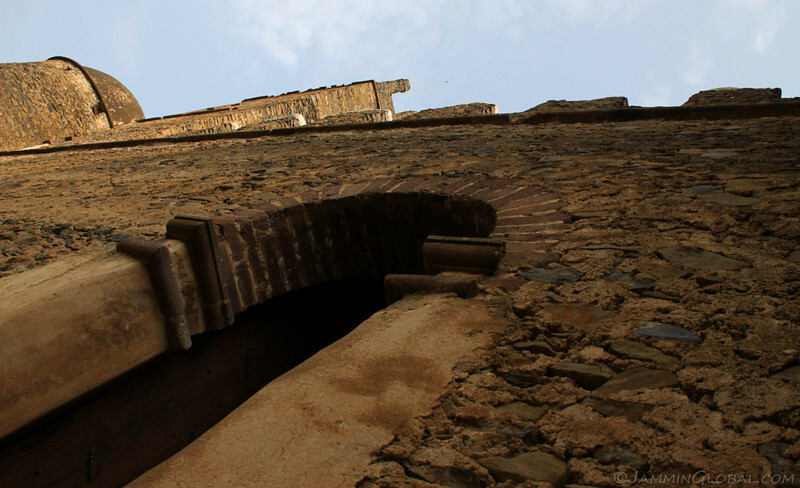 All the rooms of the castle are open to walk through. 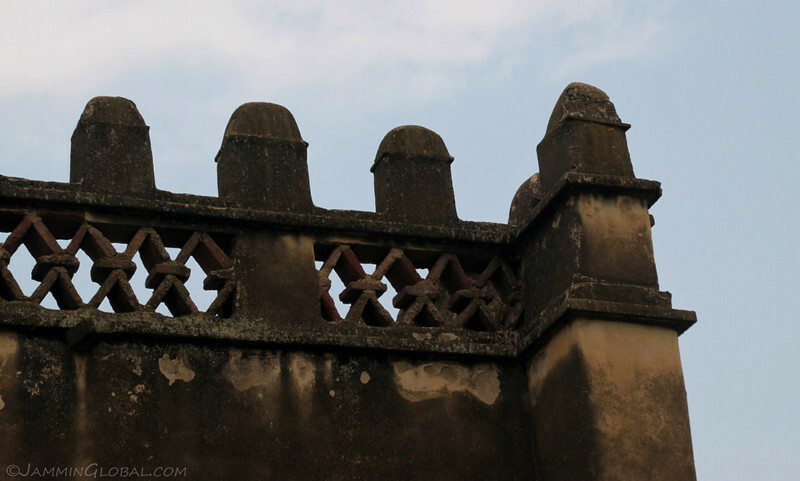 The architecture has influences from the Portuguese, Arabs and Indians, indicating the peoples that traded with Ethiopia around the time of Fasilides. Cages for lions that Fasilides kept to project his power. 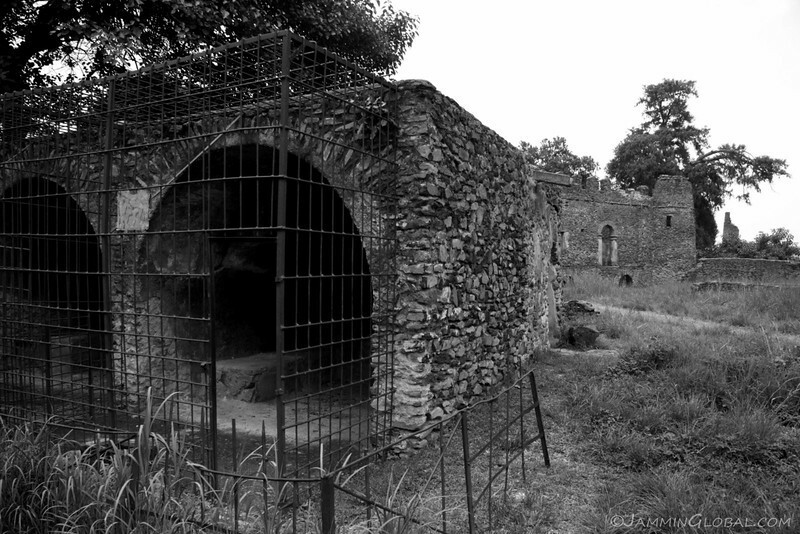 Ruins of Turkish baths at Fasilides Castle. Having dinner with Randy and Dr. Doug. 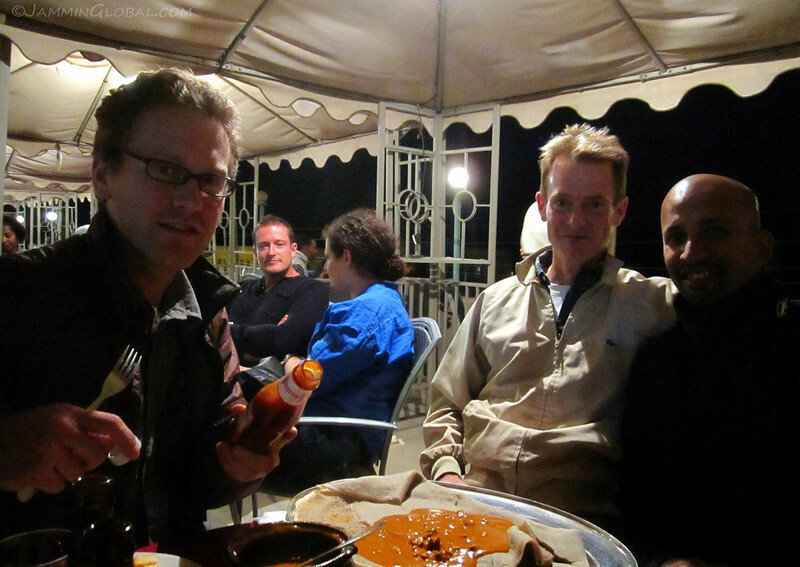 I met Randy in Gorgora after he crossed Lake Tana from Bahir Dar and I met him again on the streets of Gondar that day. He’s from Vancouver and was backpacking around East Africa for a few months and we connected over discussions on his philosophy research. 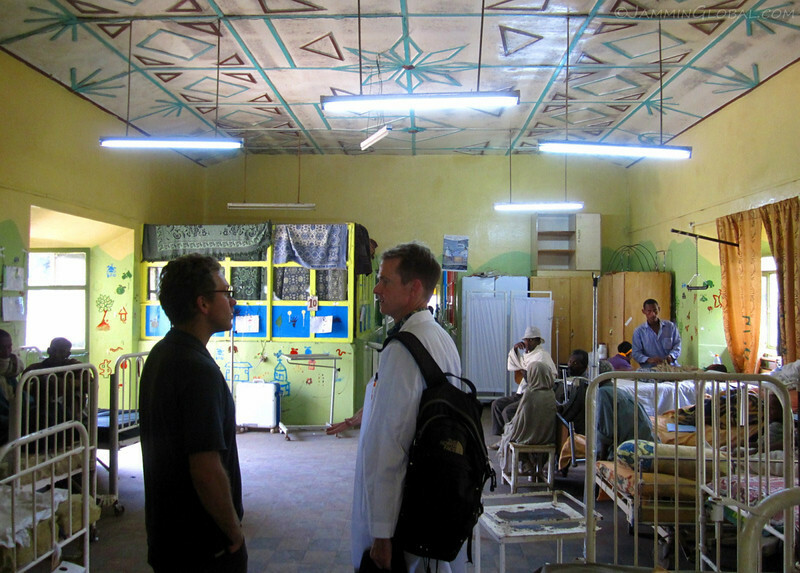 He met Doug, from Minneapolis, who’s a neurologist on assignment in Gondar from his research base in Malawi. 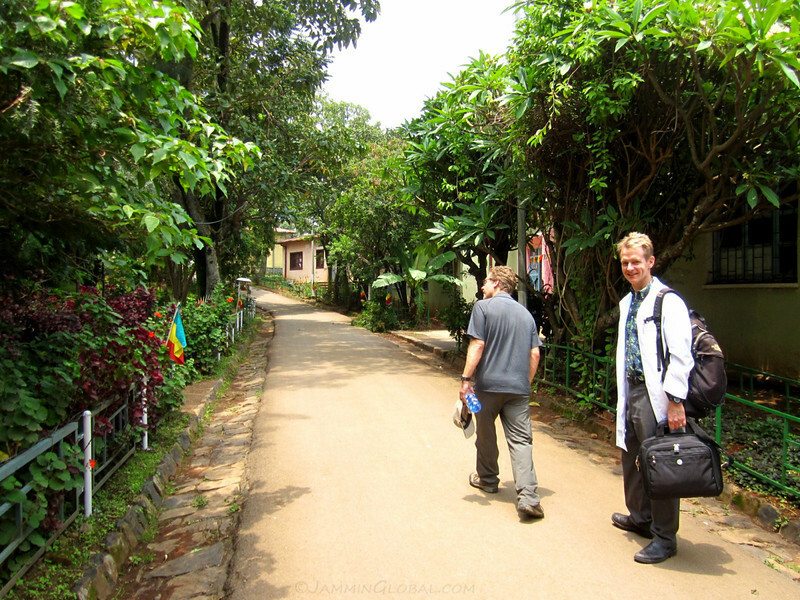 The next day, Randy and I accompanied Doug on his visit to the local hospital, which was set on a lush campus. Doug’s research is focused on neurological conditions in children and he was here to conduct some workshops and took us for a tour through the wards. I didn’t feel comfortable photographing the sick children, but here’s one of the wards. 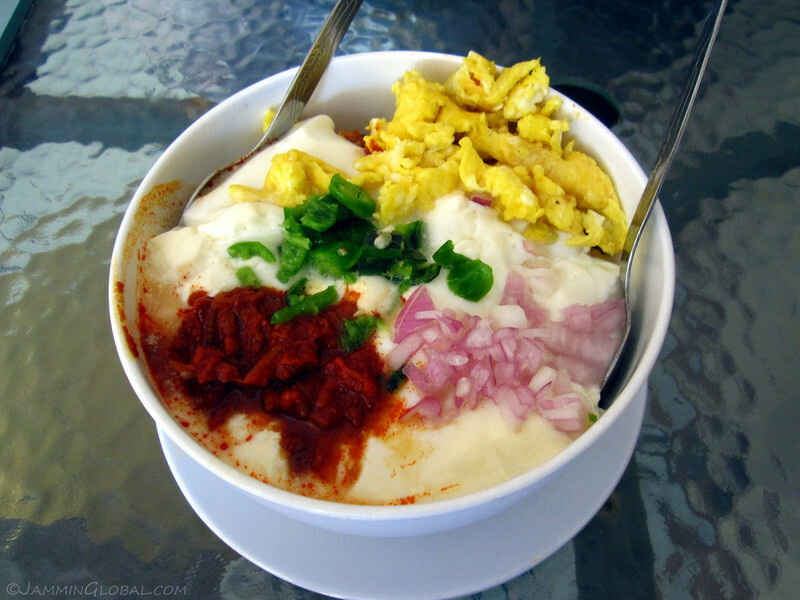 Randy introduced me to this delicious dish that consists of crunchy bread on the bottom with heaps of plain yogurt on top and garnished with scrambled eggs, berere spice in oil and onions and chilies. The clash in temperature, texture and spice was fantastic. …the church is known for its exquisite interiors. 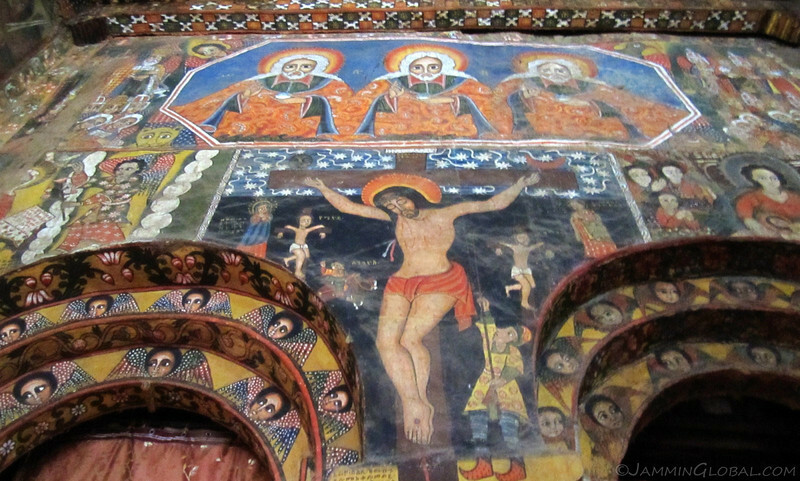 All surfaces, from the walls to the ceiling, are covered in biblical artwork from the Ethiopian Orthodox Church’s traditions. The crucifixion of Jesus takes center stage with a symbol of the Holy Trinity above. 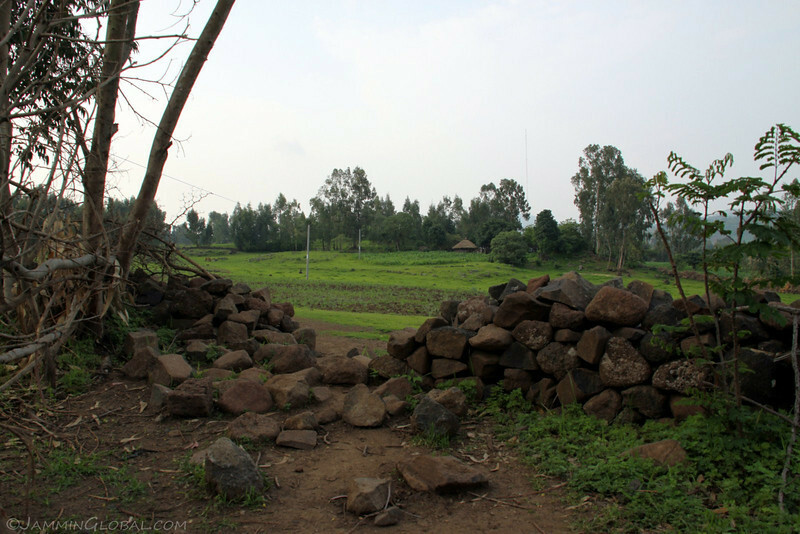 The walls depict many stories from the bible in a style that is distinctly Ethiopian. 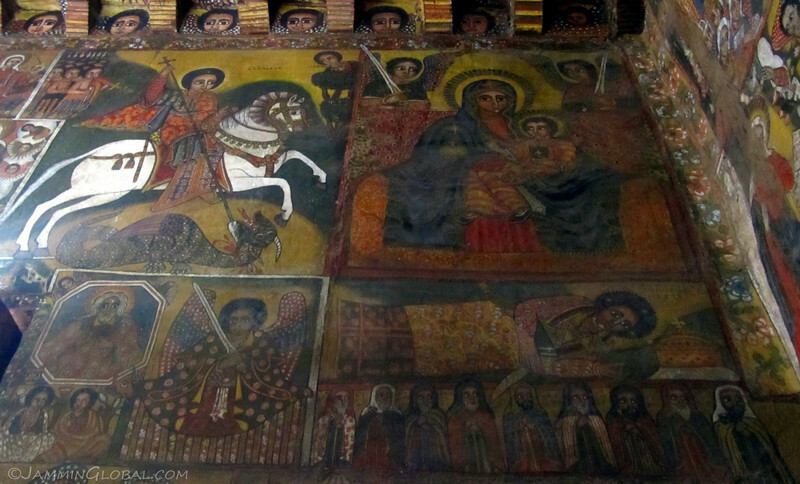 Here, there’s a saint killing a dragon, the Virgin Mary and Archangel Michael who reportedly defended the church from being destroyed by the Mahdist Dervishes of the Sudan when they sacked Gondar in 1888. 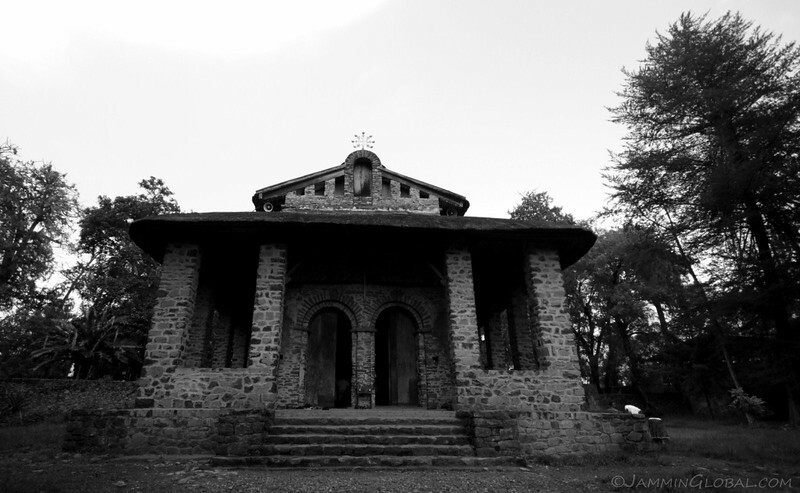 The Madhists burned down all the churches in town except this one. 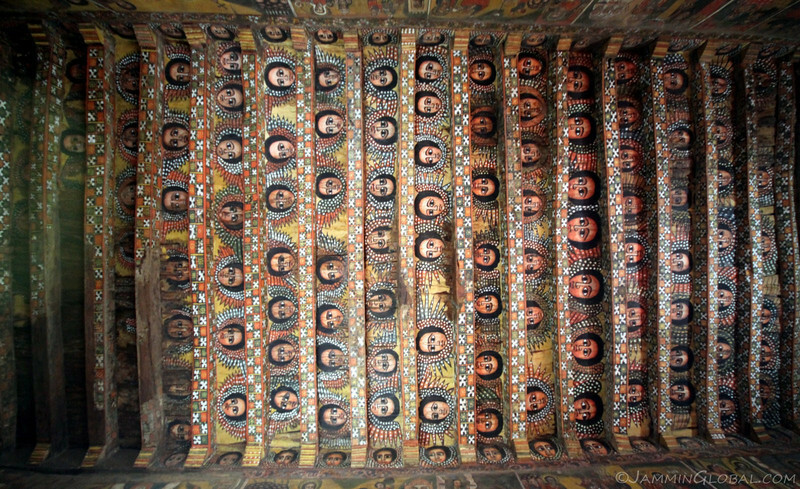 A striking feature of the Debre Berhan Selassie Church are the 104 faces of angels painted on the roof. Each one is slightly different. 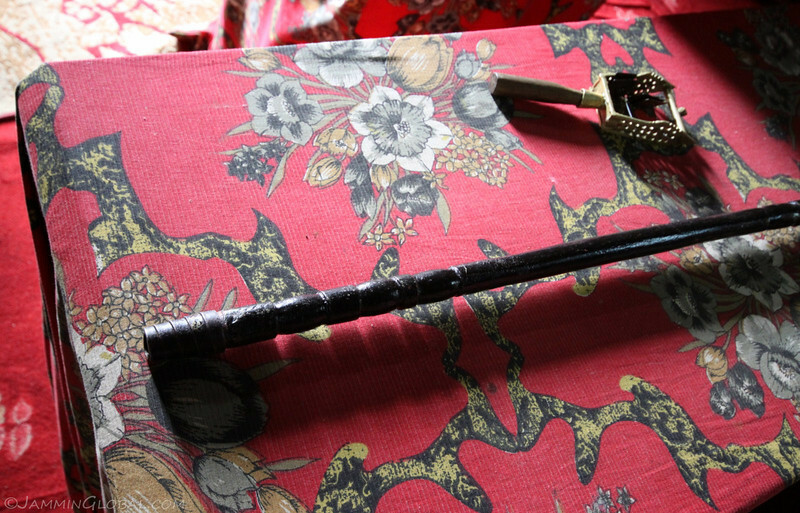 Artifacts that the priests of the church use in their worship at Debre Berhan Selassie. 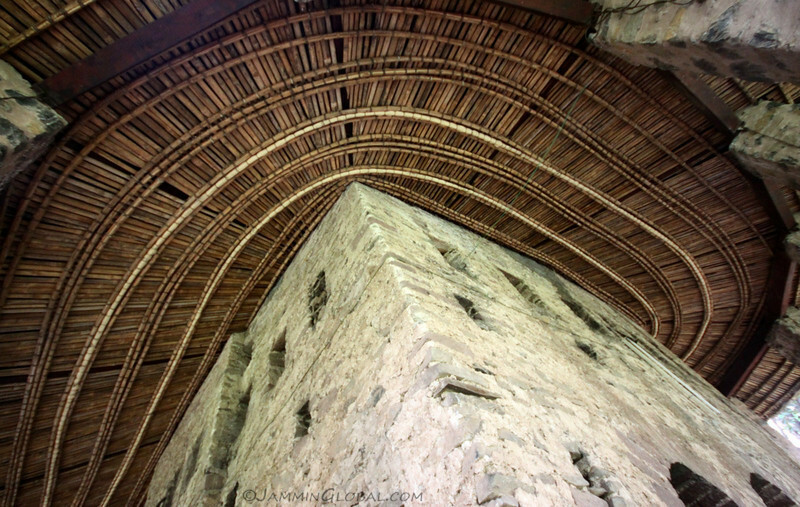 Looking up at the bamboo roof structure at Debre Berhan Selassie Church. 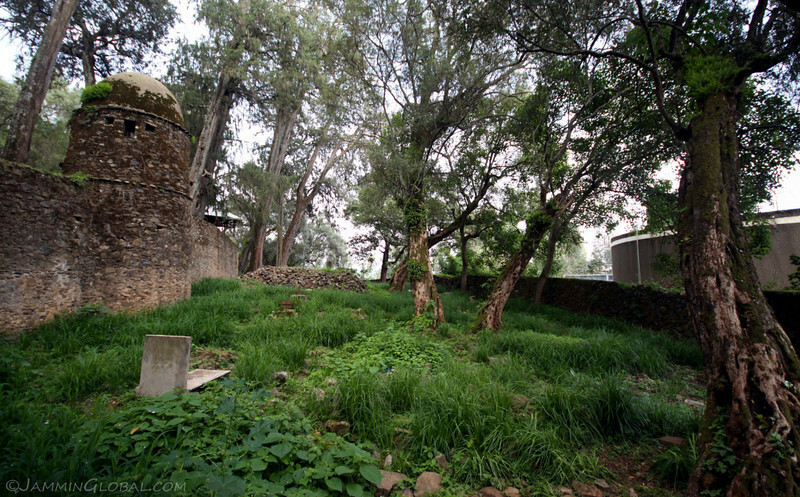 Outside the walls of the church compound lies an old cemetery overgrown with vegetation. 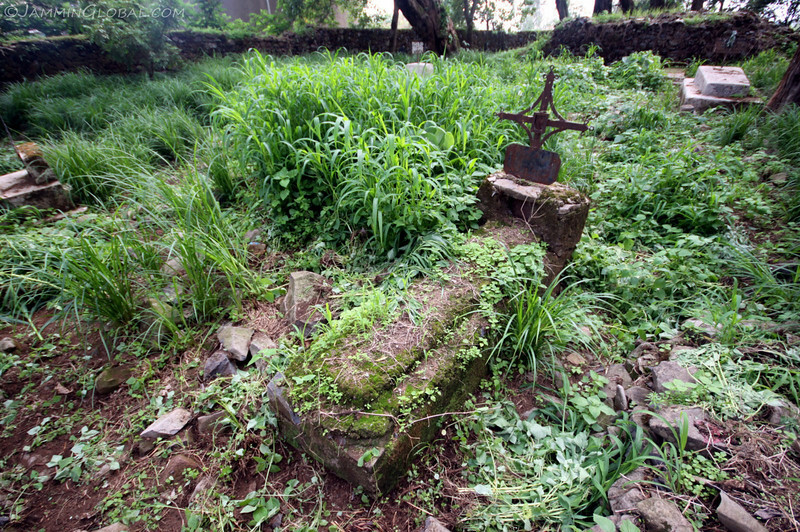 An ancient grave marker outside the walls of Debre Berhan Selassie Church. After the cultural tour, Doug took me for a nature walk outside town that he discovered recently. 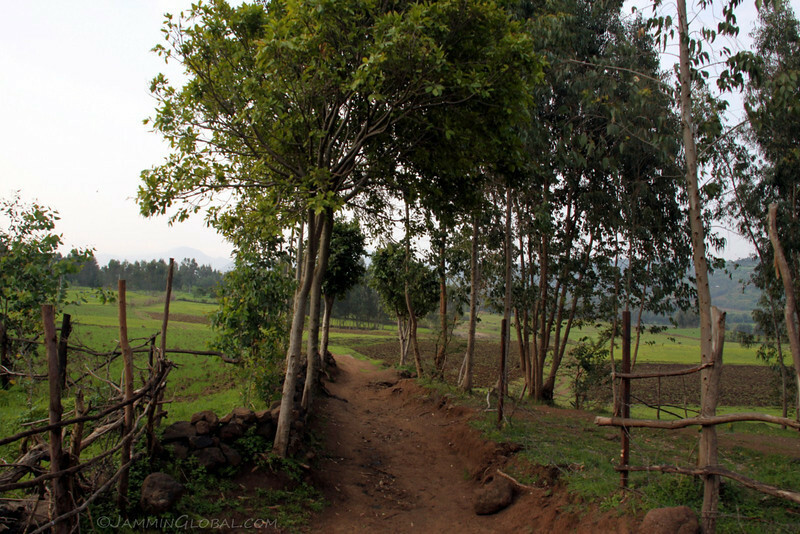 Walking along a path in the valleys surrounding Gondar. 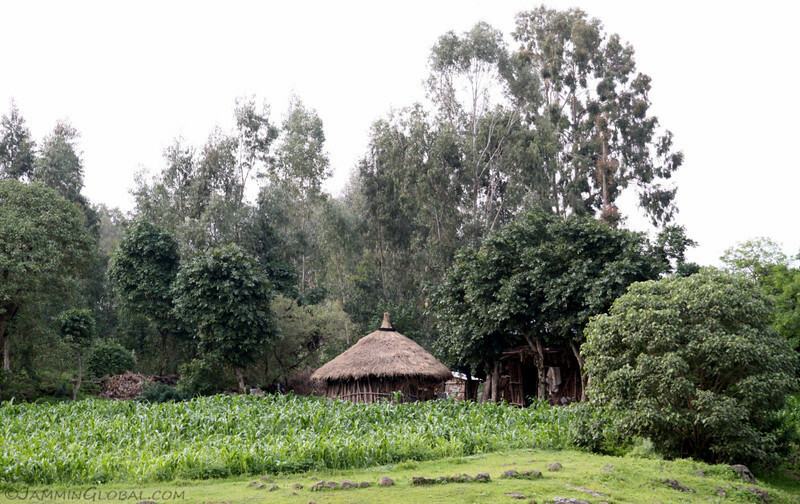 …a small maize field and its owner’s hut. Two ladies carrying some farm produce to sell up in town. Cultural sights are interesting, but being surrounded by nature is far more pleasing to me. I was glad I met Doug who showed me this little nature walk. We had good talks but he wasn’t enjoying the people of Ethiopia at the moment and told me to be aware of the growing frustrations that develop after a few weeks there. I could glimpse what he was talking about as all the local children constantly ask any foreigner they see for money or gifts or a pen. I was looking forward to my route north from here into more remote areas. Walking back into town and passing this Walia Ibex statue. 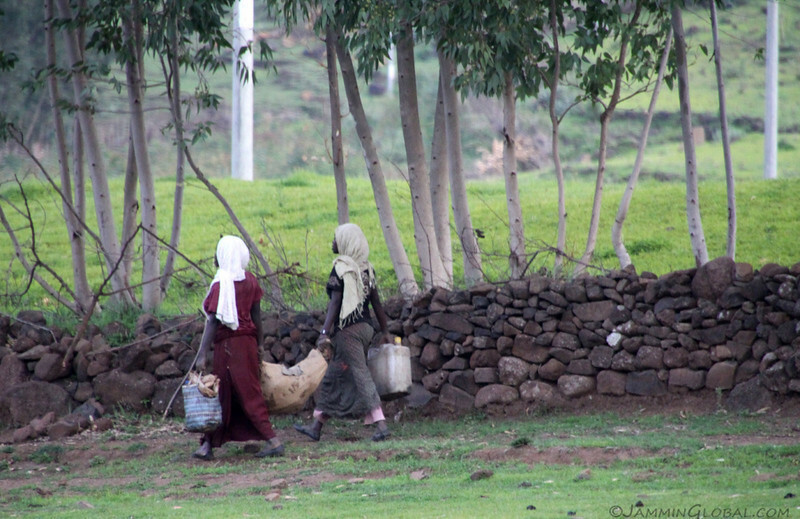 It’s endemic to Ethiopia and particularly the Simien Mountains, where I was headed next. 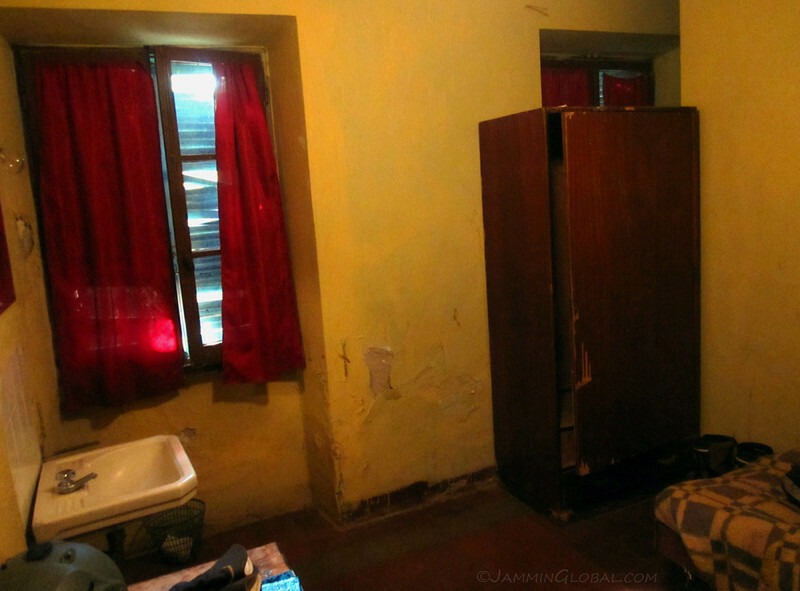 On my second and last night at Tarara Hotel, a room opened up and they upgraded me from camping in the garden. 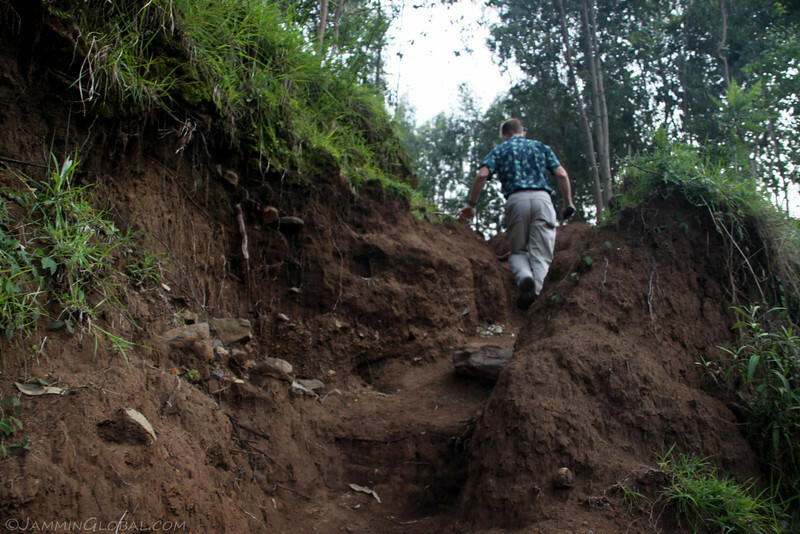 I wanted to make an early start the next day and didn’t want to have wet camping gear to pack up as the rainy season brought nightly rains. 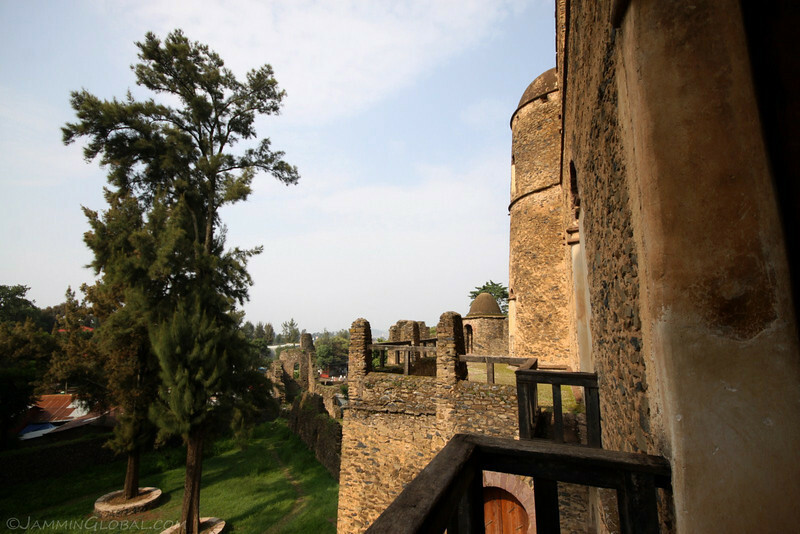 I enjoyed my short visit to Gondar and was happy to have met some other travelers who showed me some off-the-beaten path sights around Gondar. I got my cultural fix and next up was an immersion in nature.